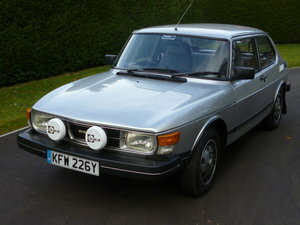 Here we have perhaps the most desirable Saab ever built and one that rarely comes on the market today. 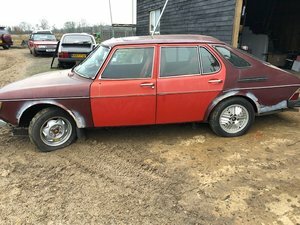 The car was the first standard prodution 5 seat Turbocharged car in the world and when the Saab 99 3 door Turbo was launched in 1977 at the Frankfurt show it received an amazing reaction and was a real show stopper, the car arrived in the Uk in 1979, it was very warmly welcomed and began it’s lesgend building! It uniquely combined a level of safety, performance, economy and fun! The 3 door Turbo was also competing very effectively on the world rally scene and regularly winning races.You may recall Jeremy Clarkson singing the cars praises on the tribute to Saab on Top Gear? Unfortunately the original shell is rather rotten, however, I’m selling it with a very solid 99 3 door shell with correct original doors, tailgate, bonnet etc, which can easily be adapted for its new role, this is mounted on a rotisserie allowing easy access to work all over and under the car. The car will need a full restoration and this has been started, however I’ve lost my storage facility and now need to sell her. 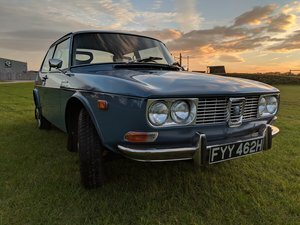 These cars are hardly ever available in the UK, there are also only a handful registered on the toad, this one and it’s associated build will give an enthusiast the opportunity to tweak the construction to their requirements. 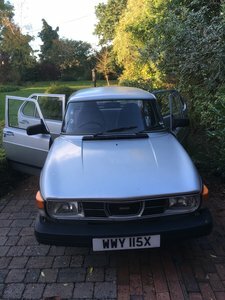 I have almost 40 years of Saab experience and am very happy to discuss any aspect of the restoration. I also have some other parts that the new owner maybe interested in.